I've been preparing for my Brayer class this weekend by brayering most anything that doesn't move. But this is my favorite. 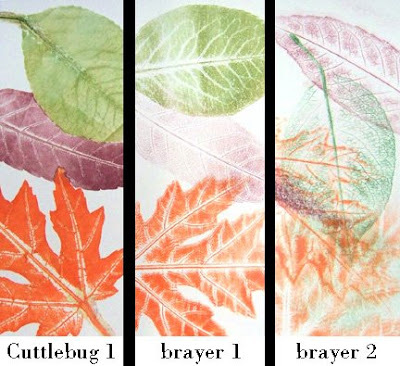 I inked up the brayer with the colors of fall, transferred the ink to a leaf and then brayered the leaf onto whisper white card stock. I liked the look but wasn't thrilled that the leaves moved and gave me ghosties. Then I thought what happens if I do it again. Again a nice soft look. Great rich color and super details of the leaves. What happens if I do it a second time through the Bug? Again great detail and a softer color. I chose that one to make the card below. Hope you like it. 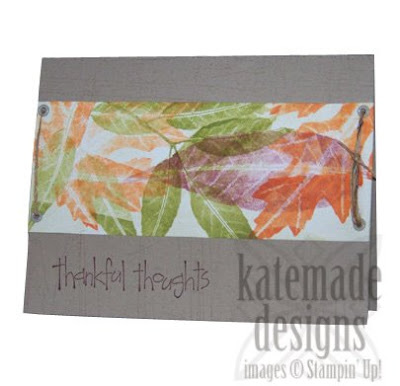 Experiment with your Bug, you can put a lot of non-stamping things through it to get really cool effects on cardstock. There is a Cuttlebug Challenge site that recently started up. I love to look but rarely have time to do anyone's challenges. Mel has a lot of great ideas on her blog for the Cuttlebug.